When I started my “business” and wrote a business-plan to get the funding, I did an income calculation that assumed that each app would have a “lifecycle” of a few months that reached its peak after a few weeks and then goes down to near zero. This way, I had to pump out apps every one or two months to maintain a steady income. My plan on “increasing” my income was that I would learn from each app and be able to create more appealing apps over time, so I could charge more for them and thus get more revenue from them, until they go down to zero again like I assumed in my business plan. Luckily, I was totally wrong about that assumption. My apps seem to be very sustainable, selling roughly the same amount every week. As you can see below, my total income for the last months is quite steady. Compared to my last month’s ad revenue from Bloo Kid, you can clearly see that I made twice the revenue from inneractive than I did with inmobi. 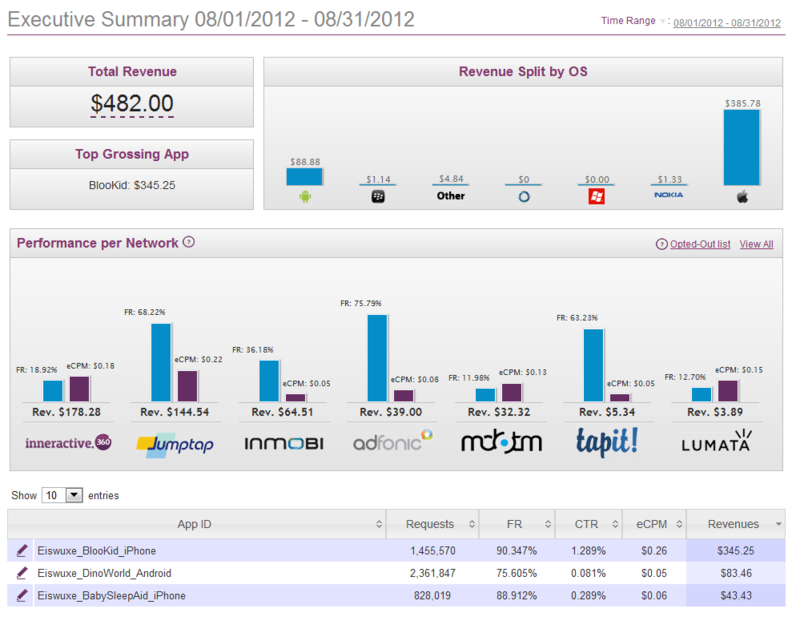 Combined with ad revenue of my other apps, I ended up with $482 from ads this month. Only very few of my apps still contain ads, since I removed them from most of my apps due to “moral issues” I have with displaying ads in kids apps. But if you have a bunch of free apps that feature ads, you can make quite a revenue with it! So how did I increase my Bloo Kid revenue? There has been a LITE version of Bloo Kid available that displays ads since the very first release of the game. At first, it contained only the first world (12 levels), the rest had to be bought. Later on, I decided to offer the first FOUR worlds (out of seven) for free in the LITE version. But the downloads really increased after I offered the whole game for free. It seems to me that there is some psychological stuff going on in the minds of the people. If they get the FULL game for free, they are more willing to download it. Even if they would get more than 50% of the game (which was the case with four worlds) they sometimes don’t download. I noticed that I totally forgot to mention my e-book sales! I made $350 in July and $260 in August. Thanks to everyone who bought the e-book so far. I would also like to mention that from all the 60 people that bought the book since its release, only TWO have asked for (and of course have been granted) a refund. Both of them were very experienced app developers who claimed that they already found out a big portion of the content themselves. I have submitted another kids app that is currently waiting for review in the appstore. It combines the puzzles and the “farm for toddlers” mechanics. This one was created with a former colleague who created the whole graphics, as I was wondering what difference art from a professional artist makes when it comes to kids apps. I hope I will learn soon (and then tell you). Very cool the open and honesty you share..very helpful! I will continue to follow the blog because of it. Looking forward to seeing more…Thanks! How do you like Monkey compared to Corona? My main concern with Monkey is how I can make it compatible with the very varied displays out there, something that seems to “just work” with Corona. How much longer do you think it would take you to make one of the puzzle games on Monkey instead of Corona? I favor Monkey over Corona in every aspect that I have tried yet! – You can directly access touch input and dont need to rely on the event listeners (which caused me some headaches in bloo kid with corona). You can of course still create your own listeners if you want. For using monkey, you need to be more experienced with programming in general. Corona is more or less “scripting” to me when compared to monkey. But if you have a bit of a background in programming, monkey gives you much more freedom and control. Talking about game frameworks,did you ever try Cocos2d-x? It’s open source, free, and widely used, I’m fascinated recently. I just know that cocos2d was “iOS-only” at first, which made it pretty unattractive to me. Nowadays there are more platforms supported, but cocos2d is still using C++ a lot, which I dont like very much. But I think cocos2d-x is still a good alternative for multiplatform development. This e-book is light on content however it often shines with valuable information unavailable elsewhere. It’s obvious the author spent considerable time exploring the various approaches to app development and app marketing. Successful ideas and strategies, especially in marketing, can often seem simple and readily available elsewhere on the internet for free. However people such as Eiswuxe create value by experimenting with those same free concepts and distinguishing, using real results and not just faulty logic, between the strategies that work and those that are ineffectual. Although a lot of the content is from his blog, I find the e-book is better organized and also contains additional information. I give the e-book an 8/10 knowing that my $30 will save me a lot of work and time. I also know that I am supporting Eiswuxe to maintain his blog and expect that he will maintain his promise to keep the book up to date and continue to include bonus material not available elsewhere. I was surprised how difficult it was to find credible information about the financial success of independent developers, even in aggregate form. It was usually: most of the money goes to a few developers and everyone else gets pennies. I was so happy to find the blog by Eiswuxe because I felt, and still feel, it is definitely the best source of information out there. After reading his blogs, I decided to purchase his e-book for the extra information he talks about and I wasn’t disappointed. Although the e-book is light on content, there are places it is particularly helpful. One of these is an ample use of comparisons. Three examples: 1) I’ve never found anyone who publishes their marketing experimentations and strategies AND posts the results AND in such detail. 2) I’ve never found anyone who described the pros and cons of different ad agencies in such a clear and thorough manner. 3) I’ve never found anyone who described the pros and cons of different game engines. Discussions I’ve seen on boards were generally comparing only one engine to another, and were also biased towards the particular experience of the developers with the engine they use daily. Other Credible Sources of Material Are Hard To Find. But what Woolbridge’s book is missing is the “personal” element, the day to day, in the trenches, experience that you can read in Eiswuxe blog and even more so in his e-book. In addition to the extra information in the e-book, the material is in one place which makes it more like a reference than a bunch of independent articles. In summary, the e-book is light on content, but much of that content doesn’t exist anywhere else. Is that scarcity worth $30? That depends on the eye of the beholder. You might not enjoy this e-book if you’ve never paid $0.99 to access features not available in the free version of an app. You might not enjoy this e-book if you enjoy spending days and weeks scouring the internet for tidbits of information because it’s free that way. On the other hand, if you value your time and appreciate the value of information, then this e-book might save you a lot of aggravation. In fact, if this e-book helps you go through the process of getting an app into the app store…then this book is worth a lot more than $30. To the more charitable among you, consider the time and effort that goes into Eiswuxe’s blog. Even though the blog is “free,” the time he spends on it is not. If $30 helps him to spend more time on it then everybody benefits. In other words, both the blog and the book are works in progress that are both going in the right direction. At the moment I give the e-book an 8/10. I expect that Eiswuxe will maintain his promise to keep the book up to date and continue to include information not available in his blog. PS If anyone knows of other sources of financial information about app developers/development, I would love to hear about it (and I’m sure others would too). I could amend my review to help point out differences. thanks for that VERY detailed review. I highly appreciate it! Thanks for the updates, very encouraging. I was about to ask about your art workings, and realised you mentioned that you’ll share the outcome soon. Could you also share your experiences with dealing with an external artist, how the communication went, and if the “chemistry” just worked or you had some fine tunings to go along the way and how they were resolved. I guess as developers, art is where many of us lack, and could really use some help with your experiences in it. You new app looks fantastic by the way! Thanks, glad you like the graphics. Yes, I will definitely share the outcome and my experiences with you in my upcoming blog post. Thanks again for your efforts and postings , I’m sure this has been great courage to many other developers including myself. I’m sure this has been asked a million times already but , what site or tools did you use to log all your revenues ?? I’m sure this brings good efficiency to a lot of book keeping and such. Lots of thanks for sharing !!! If I may ask – When you say that the daily amount does not drop below $200 from how many apps is the daily amount built of ? What is the average revenue per app ? Currently, I have 10 apps out there. But the “average revenue per app” varies greatly. 80% of my daily revenue is generated by three of my apps, while the other seven apps add together the remaining 20%. And mind that my revenue comes roughly 50%/50% from the appstore/google play, so it is very important for me to be present on both platforms, iOS and Android. Hello my name is Leo, I am an independent developer. I wanted to ask two things. 1. What works best? using in-app or have 2 versions free with paid ads and full paided. 2. Do you Use some paid method to promote your apps? which is? 1. The “conversion rate” is about the same for my apps, so it does not matter that much. I prefer one version with inapp purchase, since I only need to update and submit one app. 2. I have made only some “minor experiments” with paid advertising (mainly banner ads in other mobile apps) in the past, but I will extend this in the future and share the results.